I can't write when I'm stressed . . . or afraid. Some people can. The words pour out. It's soothing and helps their mind un-knot. Not me. It seems there is some sort of Guardian of the Grey Matter that senses struggle and immediately puts the brain into lockdown. "We are now going into lockdown mode to protect our city. Nothing creative will come in, nor will anything creative slip out. 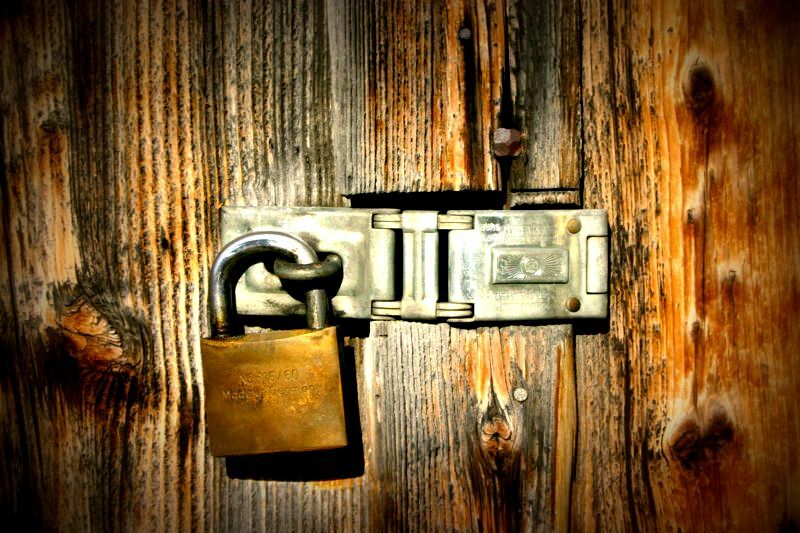 This lockdown will be so complete that at times it will cause this brain to forget all medical, dental, and educational appointments and occasionally children's birth dates. But sanity will remain intact. And I will have done my job." Hence, the long lapse in posting. I tried to write. I clicked on "blogger." I stared at the screen. I could do no more than to croak out, "Hi." But one thing I CAN do when going through life's struggles. I CAN find a truth and cling on to it. And to change metaphors now from a city to a body of water, this truth will keep me afloat and bring me safely out on the other side of trouble. 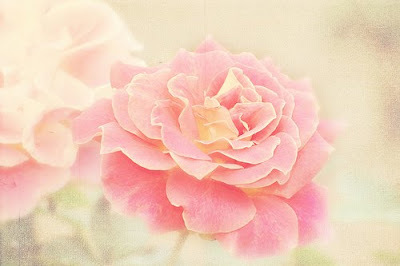 "Do not be afraid or discouraged because of _____ (fill in the blank!! any person, place or thing will do!! 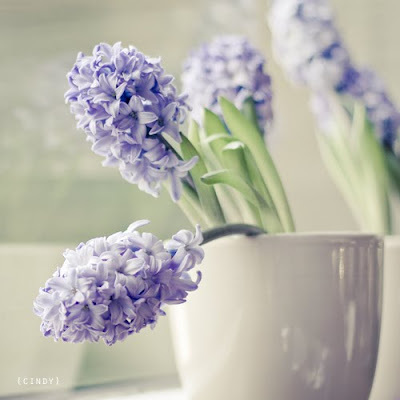 ), for there is a greater power with us than with him!! With him is only the arm of flesh, but with us is the LORD OUR GOD to help us and to fight our battles!" Wow!! 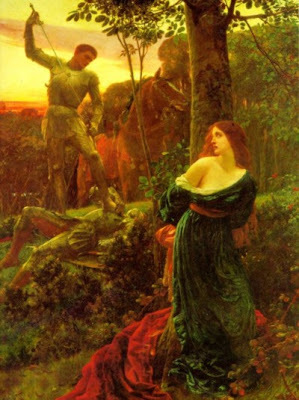 It seems that I've written several times about the "knight in shining armor" concept. I now am beginning to understand that I actually have a true, never-tiring Warrior to fight for me, with unending strength, wisdom, love and courage. And that, my friends, will give a girl confidence and security any day of the week!! What's more fun than one 17 year-old girl? Why 9 of them, of course. And that is exactly what descended on the house Sunday night. Older 2 Sons were sent away; they were afraid they would not be able to cope with estrogen overload. Man of the House was caught trying to escape with them but was quickly corralled. We did, after all, still need someone to lock up the house, take the dogs out to the bathroom, and tell us where to park all the cars. Of course, over the course of the night, there were the appropriate screeching and giggling, bursts of applause and eerie silences, bouncing and singing. Youngest Son rolled his eyes, shook his head, and said, prophetically, "I will never understand girls!" 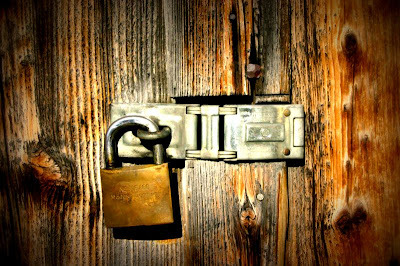 Even Youngest Daughter looked slightly askance toward the closed rec room door . . . not sure what to think of the more mature of her gender. 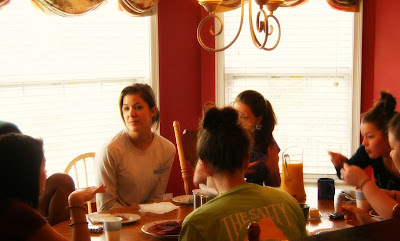 For my part, I just wanted to give them a yummy breakfast. There was, of course, no hidden motivation to be known as "the mom who can cook," it was all just motivated by love for Oldest Daughter and her friends . . . ahem. The menu? Simple and straightforward . 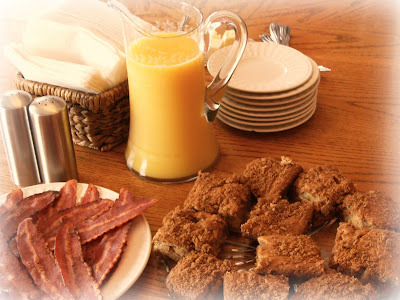 . . homemade sour cream coffee cake, turkey bacon, orange juice (the real thing! ), and Swiss almond mocha coffee. Easy peasy. Lest I disturb the cosmos by operating in any way out of the ordinary, I ran to the store that morning for my ingredients. We won't, at this time, explore that behavioral pattern any further. 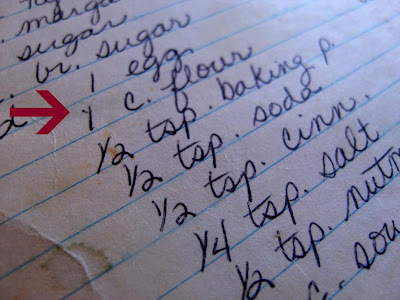 I whipped out my recipe . . . last used 10 years ago. I wanted the breakfast ready by the time the girls were up. I wanted the kitchen smelling of the heady combination of perking coffee, crisping bacon, and a cinnamon/brown sugar confection just being popped from the oven. In the back of my head I was chanting, hurry, hurry, hurry. Excuse me? Although it may have not been baked in 10 years, there was a time in which it was baked quite regularly. 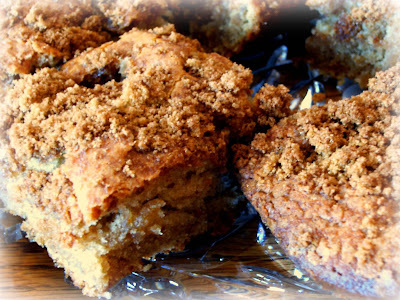 What coffee cake recipe in the whole world has a fraction of flour of any sort? I guessed. And continued dumping ingredients. This little chant in the back of my head is also why without thinking I dumped in an entire carton of sour cream . . . 16 full, creamy ounces . . . and cheerfully set to mixing. Then I tasted. Hmmm, not as sweet as I remembered . . . actually kind of sour . . . as if someone had put in too much . . . sour . . . cream . . .
Aha. Yes. Now the coffee cake from the "mom who can cook" had a guessed-on flour amount and double the sour cream. I tried to increase the other ingredients proportionately. By some miracle, the coffee cake turned out, due more, to be sure, to the forgiving nature of those blessed ingredients flour, sugar, and butter than to any of my cooking prowess. And as the girls came downstairs, coffee was indeed perking, crispy bacon lay in delicious repose on its plate, and an etched crystal platter held crumbling chunks of Unsure-Flour-Double-the-Sour-Cream coffee cake. "It smells sooooooo good down here, Mrs. M.," came a sweet 17 year-old voice as 18 feet trompsed down the stairs. Oh, yes, life is good. It's official. I'm the Mom Who Can Cook. Combine first seven ingredients in a large mixing bowl. Add sour cream, butter, and eggs. Beat at low speed with an electric mixer until moistened. Beat at medium speed for 3 minutes. Spoon batter into greased and floured 9 x 13 pan. Combine remaining brown sugar and cinnamon (1/2 cup chopped pecans can also be added to this brown sugar mix). Sprinkle over batter. At this point, the coffee cake may be baked immediately at 350 for 30 minutes, or it can be covered, refrigerated up to 12 hours, uncovered and baked at 350 for 30-35 minutes or until a wooden pick inserted in center comes out clean. This year as "Easter Eve" rolled around I kept the egg dyeing all to myself. I had seen a lovely idea on Southern Living's web site, and I wanted the egg dyeing process to be all mine. Thankfully, none of the children minded. 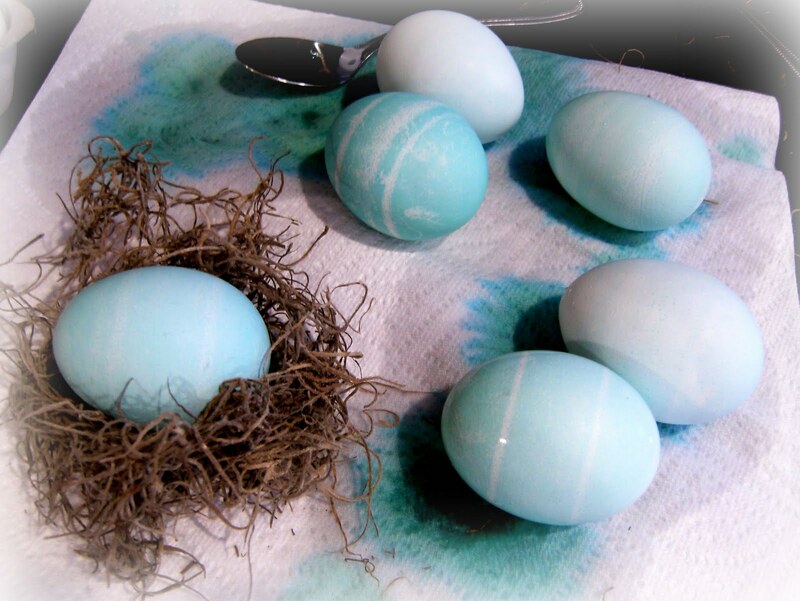 The blue eggs were just dyed with food coloring, and the tan eggs were dyed in a strong tea mixture. The eggs were then splattered with dark brown acrylic paint by dipping an old toothbrush in the paint and running my thumb across the bristles. 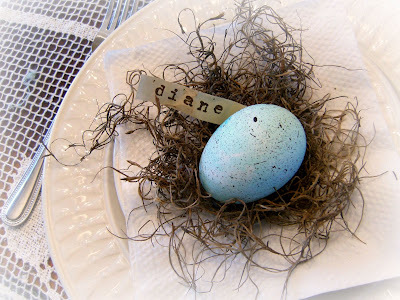 Then with the finished eggs nestled down in a little Spanish moss "nest" and a name tag tucked in, they were perfect "place cards." I did not hard boil the eggs. I do not like egg salad. I do not like hard boiled eggs. I left them raw. 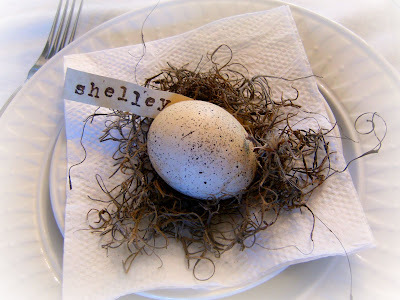 Now this did present a challenge, in that there was a little bit of question as to what to do with one's raw-placecard-egg once the meal had begun. Oldest Son took this in hand. He stood up to announce to the table-ful that the eggs were not hard-boiled and that everyone should be careful. He picked up the two corners of the napkin on which his "nest" was laying to demonstrate how the raw egg could be lifted in its sling and placed to the side. 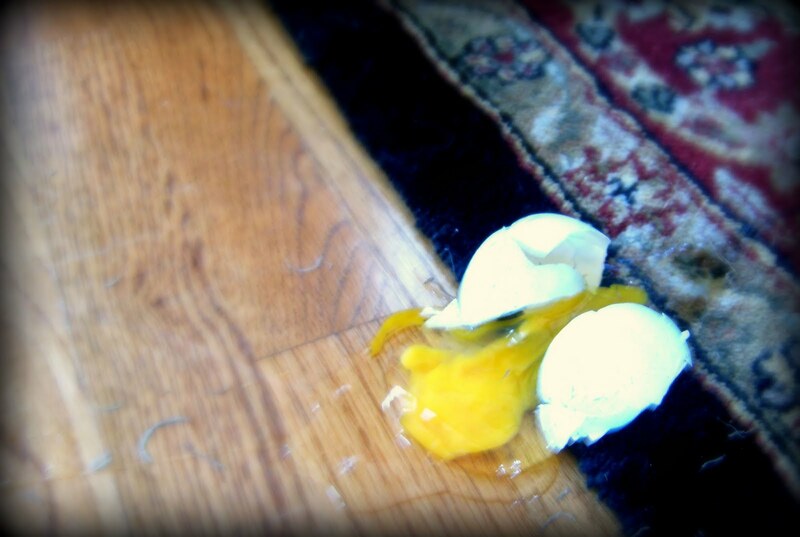 I was in the kitchen when I heard the crack, the splat and the resulting gasp from the table as the egg slipped neatly from its sling onto the wood floor and oriental rug. Ah, yes, everyone should be careful . . . very, very careful. On a brighter note, the day also included an Easter egg hunt. 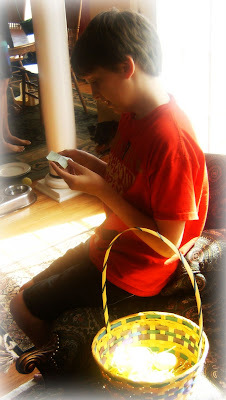 Here, Youngest Son contemplates a clue leading to a surprise. 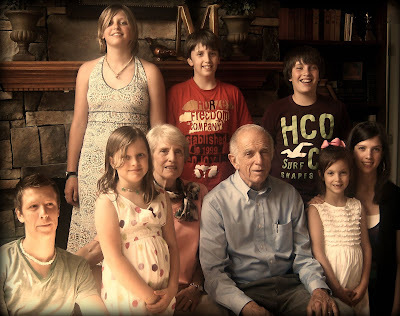 And it's always fun to see all the grandkids together clustered around My Mom and My Dad. I just love 'em all!! Well, here I am . 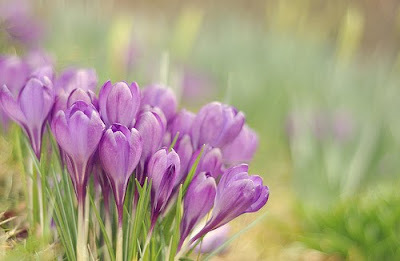 . . back from bloggy break. Library books, clean laundry, and greeting cards all where they should be. And the checkbook, oh the checkbook. Yes, it has recovered and is getting along just swimmingly. Oh, yeah, frustrations with accountant-husbands. But it must be said that one of the truly nicest things about being married to an accountant is that if I make some messy financial mistakes, he can pretty much rescue me. And I'm not too self-sufficient not to just love me a little rescuing some times . 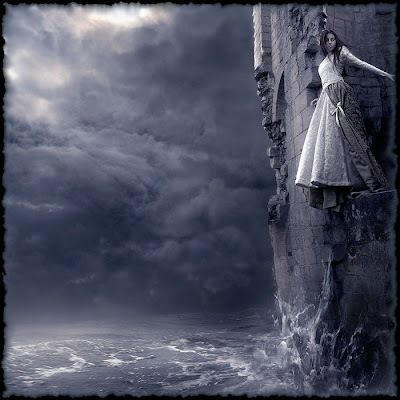 . . yes, a little damsel in distress . . . uh-huh, a little fair maiden tied to the proverbial train tracks. Come to think of it, this accountant-husband of mine is quite a knight in shining armor. And I need to remember that, when I go to drive his car and he asks me not to get any fingerprints on it because he just washed it. 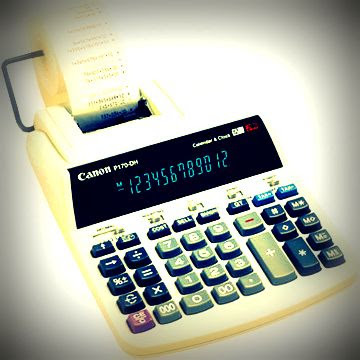 Funny thing about those knights in shining armor---sometimes they throw you off a little by showing up in glasses, a starched white shirt, and running a 10-key adding machine . . . really fast. 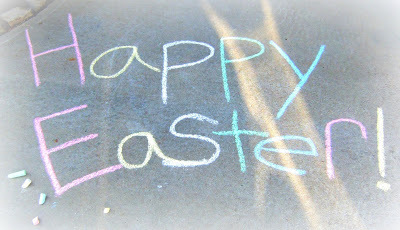 Have a wonderful Easter, Friends. Back on Monday : )! !